The crowd was huge, and some of them even had tickets. Many took advantage of the general spirit of friendliness and sat anywhere they could. It is easy to see why the forefathers of the security men at Peshawar could not control the Khyber Pass. Amid the confusion, a legend was born there 20 years ago. He was 16, had almost curly hair, curiosity in his eyes, and steel in his wrists. His treatment of Abdul Qadir is part of folklore now. 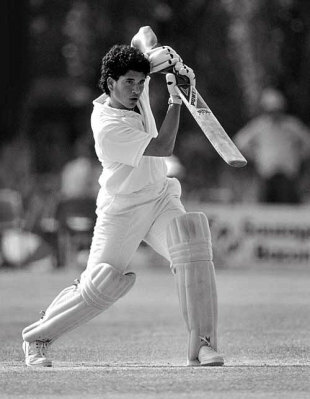 Sachin Tendulkar played only because it was not an official one-day match, and Kapil Dev was nursing a stiff neck. At that stage there was no plan to play Tendulkar in the one-day tournament at all. But after that he couldn't be denied. Eighteen deliveries changed everything. In that time he made 53 (unbeaten), hitting Mushtaq Ahmed for two huge sixes, and then Abdul Qadir for 27 runs in a single over, with three sixes in a row. There was no wild slogging. When Qadir dropped one short as Tendulkar stepped out, the batsman had the arrogance to go through with his shot anyway. The bat made a lovely arc, and for all we know the ball is still travelling - no one could find it. At the other end was the captain, Kris Srikkanth, no slouch himself. Later that evening he said, referring to the one-day series, "The little bugger must play now." The little bugger has been playing ever since.